Siddal v Castleford Lock Lane. Gareth Blackburn. Siddal have finished top of the National Conference League by a six point margin after a 34-12 home win over Wigan St Patrick’s yesterday. The League Leaders Shield winners pulled well clear in the second half to avenge one of only four defeats in 22 games this season. 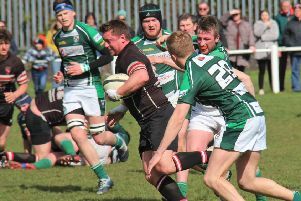 Gareth Greenwood’s men, who had lost the away fixture by two points in May, scored six tries to ensure they will enter the play-offs in good heart. Ben West streaked over from close range for the opener on four minutes and Gareth Blackburn added the first of five conversions. The lead was doubled on 16 minutes when Tom Garratt muscled his way over and Blackburn added the extra but Tyler Spence went almost the length of the field to reply on 23 minutes and Dean Hutton converted. It remained 12-6 up to half time but a flurry of scoring followed the break. Zach McComb scored a superb individual effort seconds after the restart but Mike Scrivens was quick to reply, the goals making it 18-12. Leading try scorer Shaun Garrod then jinked through a static Saints defence on 45 minutes and Blackburn converted via a post. When centre McComb bagged his second from Garrod’s pass on 51 minutes, Blackburn converted to open a match-winning 30-12 lead. Blackburn scored the final try with 16 minutes left following good work from Craig Sanderson wide on the left. The play-offs start next Saturday when third-placed Leigh Miners face sixth-placed Wigan St Patrick’s and fourth-placed Rochdale Mayfield host fifth-placed Wath Brow Hornets. West Hull have finished second after they beat Lock Lane 48-0 yesterday and reigning champions Leigh Miners lost 36-22 at Mayfield.